BERLIN — Authorities say a van crashed into a crowd Saturday outside a popular bar in the German city of Muenster, killing three people and injuring 20 others. The driver of the vehicle shot and killed himself after the crash, local police said. Six of the injured are listen in critical condition. It’s not yet clear who the suspect is or what the motive is. Police are still investigating whether this was a terror attack and said they are examining reports that other suspects may have fled the crash scene. Police said on Twitter that residents should “avoid the area near the Kiepenkerl pub” in the city’s historic downtown area where a large-scale police operation was underway. Police said a suspicious object was found in the van and they’re still examining it to see if it is dangerous. They told German news agency dpa that the object was the reason why a large area around the scene was sealed off after the crash. Muenster Mayor Markus Lewe said the reason for the crash was still unclear. Residents said they were enjoying the first warm afternoon in the area that features many shops and cafés, CBS News correspondent Roxana Saberi said on CBSN. People were outside enjoying themselves, many of them college students, enjoying the weather. Police block a street near a place where a vehicle drove into a crowd, killing several people and injuring many others in Muenster, Germany, on April 7, 2018. Muenster, a major university city, has about 300,000 residents and an attractive city center rebuilt after World War II. 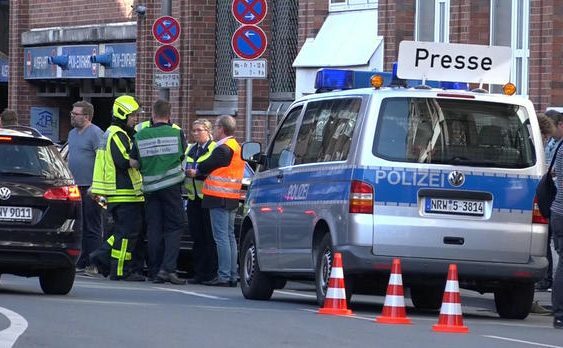 German news Television n-tv showed a narrow street sealed off with red-and-white police tape. Dozens of ambulances were waiting near the cordoned-off downtown area. Helicopters were flying overhead.